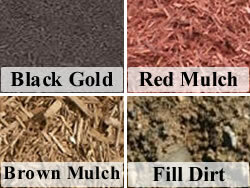 Welcome to J & J Mulch Providing high quality mulch and landscape products and services to our community for years! Your source for all your mulch and landscape needs. Carrying quality products at affordable pricing. An established business with an earned reputation of great customer service! Trust your hometown professionals to get the job done right... every time! Aged hardwood - commonly referred to as "Black Gold"
Mulches are used for various agricultural and gardening purposes, they are applied to the soil surface. Properly used, they benefit plant growth and minimize garden labor. Beyond the immediate benefits of being visually stimulating and aesthetically pleasing, the main functions of mulches are the conservation of soil moisture and the moderation of soil temperature. They moderate internal soil temperatures by retaining heat from the day and radiating it to the soil at night during spring and fall; in the winter mulches moderate soil warming during the day, limiting the stress plants undergo during soil freezing and thawing cycles. They also are used to prevent frost heaving of unestablished plants in winter. During summer, they keep soil cool by blocking direct sunlight exposure of the soil surface. Mulches are used to block evaporation of water from the soil, slowing down soil drying. They also help control the growth of weeds, blocking sunlight and/or smothering weed seedlings under layers of material. Mulch also reflects sunlight back from the ground to the leaves of plants, they also provide a clean and dry surface for ground-lying fruits. They prevent soil erosion from heavy rains, prevent surface run-off of water, and prevent the direct impact of hard rains on the soil surface. Some mulches improve soil texture, adding humus (partially decomposed organic matter; the organic component of soil). Organic mulches may add nutrients to the soil as they breakdown. Biodegradable mulches, as they decay, are incorporated into the soil where they provide air spaces and surfaces for healthy fungi and positive root growth. While mulching may improve the growth of various plants by directly manipulating the plant's abiotic environment, mulch can also improve growth as an effective means of pest control. Various forms of mulch deter herbivorous insects and increase the numbers of beneficial insects.